Ten years ago, Qui Nguyen went on a mission to learn about how his parents — Vietnamese refugees during the Vietnam War — came to America. Born in the United States, Nguyen often wondered how he could honor his parents’ story regardless of their language barrier, cultural and generational differences, and the fact that Nguyen didn’t know much about their lives before he was born. At first, getting his parents to talk about how they escaped their home country during a tumultuous war and met at a refugee camp at Fort Chaffee in Arkansas proved difficult. But, after each effort, they began opening up. 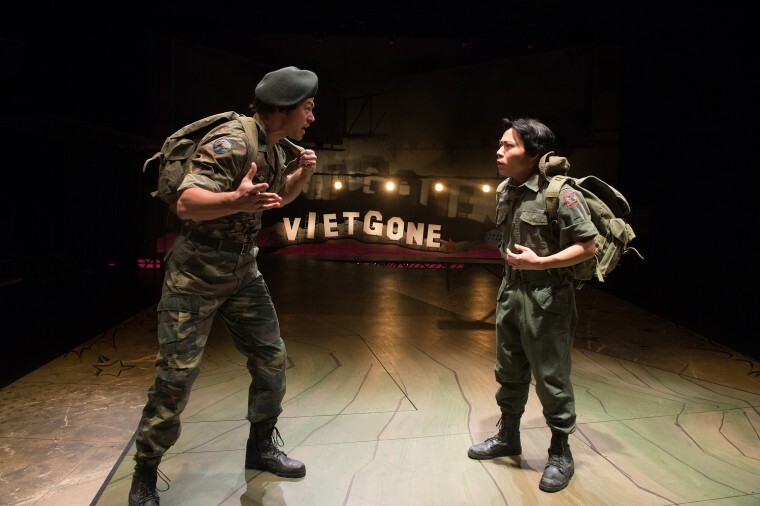 Their narratives came together to form Nguyen’s script for “Vietgone,” an Off-Broadway play about the sense of displacement Vietnamese refugees experienced when they resettled in America. Tied together with the love story of Nguyen’s parents, “Vietgone” explores both the identity of Vietnamese immigrants and that of second-generation Vietnamese Americans who exist in between two cultures. The show tells a historical account of the Vietnamese refugee experience using elements of Nguyen’s modern style: humor, ninja fights, comic book aesthetics, and hip hop. “Vietgone” also features Asian main characters played by mostly Asian casts — an uncommon thing to see in theatre. For Nguyen, writing a story about Vietnamese refugees was his way of humanizing Asian Americans and refugees of all races. He notes that, unintentionally, the play reflects today’s Syrian refugee crisis, the stigma that comes with immigration, and experience of starting over in a new country. Orange County’s South Coast Repertory and the Manhattan Theatre Club have also commissioned sequels: two new plays covering Nguyen’s family history and the Vietnamese refugee experience. These shows are scheduled to go on stage every two years: play two in 2018 and play three in 2020. They will first play in California, Nguyen said. The second play of the trilogy follows the lives of Nguyen’s parents — named Tong and Quang — after the events of the first play. In this play, they’ve moved beyond the refugee camp and have settled in the small Arkansas town Nguyen grew up in. Tong and Quang now have kids and the play introduces issues second generation Asian Americans may be familiar with. One of the themes in the show deals with the language barrier between immigrant parents and their children. The third play is about Nguyen’s cousin and his experience as a “boat person” who escaped Vietnam during the war. Like “Vietgone,” play three covers real heartbreaking experiences many refugees faced, such as losing loved ones at sea. Both plays touch upon what happened to certain characters in “Vietgone” that were left a mystery. The follow-up plays will contain similar creative choices as “Vietgone.” The Vietnamese refugee characters will continue to speak in fluent English while non-Vietnamese characters speak in broken English when addressing the refugees. Nguyen is no stranger to advocating for diversity in theatre. The founder of the Vampire Cowboys, a “geek theatre” company known for live action comic book plays casting LGBTQ actors, people of color, and females as superhero leads, his mission has long been to create leading roles for people who rarely get to see themselves that way. Writing this trilogy was his way of explaining his family’s cultural history to his kids and creating characters for Asian Americans who may feel like they’re not portrayed accurately in film, television, and media. Nguyen notes that while there are famous Asia-born actors like Jet Li and Jackie Chan on screen, they don’t represent culturally different Asian Americans. While “Vietgone” is a progressive move for Asian-American writers and actors, Nguyen believes that more work needs to be done.